Bum, bum, bum, hear the sound of my drum! But, real drums break and decorating is not the ideal use for the instrument. Using drums in a Nutcracker scene or for a Victorian Village theme is phenomenal! We have crafted life-sized drums constructed of polyresin. The realism of each piece is evident from first glance. The red and gold colors bring out accented tones in the venue they are placed in. At 3' there is virtually no setup. 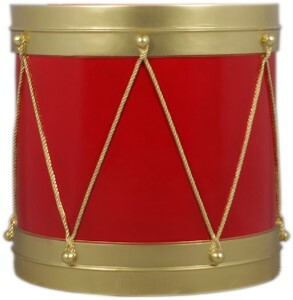 These drums are sure to be rhythmic decor in your Santa visiting area, mall displays, banks, and more!